It was roughly six months ago that we first saw Eyefinity being demonstrated, at the launch of the Radeon HD 5870. As well as DX 11 support and a burst of extra performance, the HD 5000-series had three display output controllers, and with each capable of driving two screens making a six-screen setup possible. At the launch, ATI was still working on the driver (to add such things as bezel correction: more of which later) but a representative of the company dropped by Dennis Towers a week ago to show the progress that ATI has made with its premium solution: six-screen Eyefinity and the Radeon HD 5870 2GB Eyefinity Edition. First, let’s go over what Eyefinity is. It’s tied to the new triple-output capabilities of the Radeon HD 5000-series – any Radeon HD 5000 card can output to three screens simultaneously. Because one of the display controllers can only output over DisplayPort, this means that one of the screens must have a DisplayPort input or that you’ll need a convertor cable. Most Eyefinity setups use two DVI and the DisplayPort, though you could use just one DVI output, along with the HDMI and the DisplayPort. Annoyingly, you can’t use the two DVI outputs with the HDMI, which would be more common, and despite every HD 5000 card having four digital connectors on the back (custom partner cards aside), you can’t display on more than three screens simultaneously. To output to six screens simultaneously requires a bit of extra technology – six mini-DisplayPort outputs on the card, and more frame buffer space. Enter the Radeon HD 5870 Eyefinity Edition, with its neat arrangement of six tiny mini-DisplayPort outputs. The only other difference between the Eyefinity card and a standard HD 5870 is an extra 1GB of DDR5 memory, making for 2GB in total. This is necessary thanks to the extra-large frame buffer that the card is likely to be creating. High quality textures and vast maps in games typically use just shy of 1GB of graphics memory these days (roughly 1,000MB, leaving 24MB for the frame buffer), so if your frame is the size of six standard screens, it’ll push some of those textures out of fast local memory and back into slower system memory via the CPU, thus leading to slow-downs and stutter frame rates. For example, were you to use six 1,680 x 1,050 screens for your Eyefinity setup, the frame would be 6 x 1,680 x 1,050 x 24-bit large (remembering that 32-bit colour depth is actually 24-bit with 8-bit redundancy to make the calculation more computer-friendly). This makes each frame 30.3MB large, which could be enough to interfere with local texture storage. Increasing the size of the screens and you could end up with a frame buffer as large as 39.6MB for six 1,920 x 1,200 panels. Unfortunately, it looks like DRAM follows the exponential laws of computing – capacities of the chips double, hence the much larger 2GB of memory on the Eyefinity card rather than 1GB on the standard HD 5870. We’re not allowed to post any performance numbers about the card as yet, so you’ll have to wait to see if 2GB of memory makes a difference to frame rate or not. With all the theory covered, let’s see what the end results are on the next page. 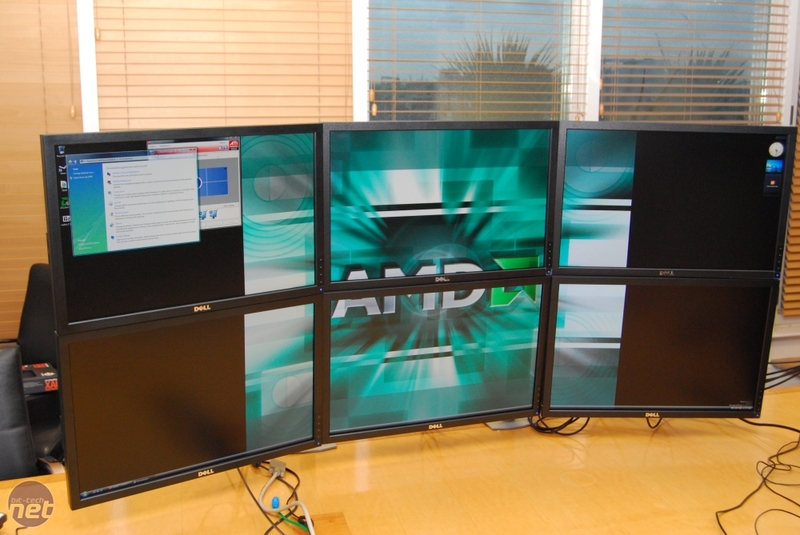 Three screens on one stand sounds convenient, but is the MD230X3 widescreen Heaven or Hell?